Virginia's governor won't resign over blackface, KKK photo. What's next? Despite facing fierce demands from across the country, Virginia Gov. Ralph Northam refused to resign in the aftermath of his medical school yearbook page surfacing, showing one man in blackface and another person wearing a Ku Klux Klan robe. Northam, in a Saturday afternoon news conference, claimed he'd never seen the yearbook page before and partially rescinded an earlier apology where he acknowledged he was one of the two individuals in the photograph. "I am not the person in that photo," Northam said. He said he would not step down, calling that an easier choice than the "difficult path that lies ahead" in working toward earning back the trust of Virginian voters, Democrats across the nation and his colleagues. "I am asking for the opportunity to earn your forgiveness," Northam said. If Northam sticks by his vow to continue serving as governor, it's unclear what might happen next. Lawmakers in the state could elect to examine impeachment proceedings as Virginia's Constitution says elected officials who commit "malfeasance in office, corruption, neglect of duty, or other high crime or misdemeanor" may be removed. 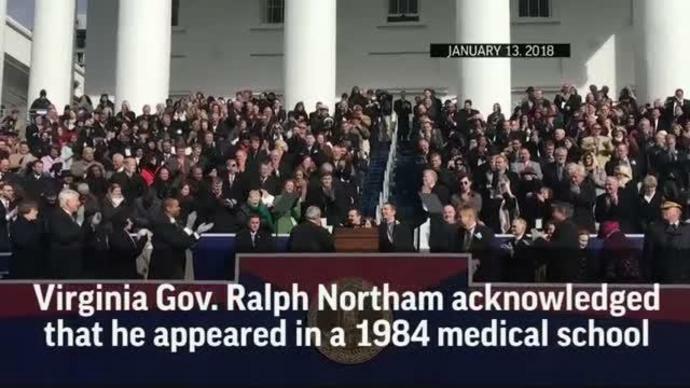 The wording of the law makes it unclear whether it could be used to remove Northam from office, especially since the photograph in question was from more than 30 years ago. The Constitution also outlines the line of succession, detailing the process if Northam were to be ousted. "Whenever the Attorney General, the President pro tempore of the Senate, and the Speaker of the House of Delegates, or a majority of the total membership of the General Assembly, transmit to the Clerk of the Senate and the Clerk of the House of Delegates their written declaration that the Governor is unable to discharge the powers and duties of his office, the Lieutenant Governor shall immediately assume the powers and duties of the office as Acting Governor," the Constitution states. John Dinan, a professor who specializes in state constitutionalism and state politics at Wake Forest University, told the Washington Post that despite the vague wording, impeachment could still threaten Northam's governorship and set up a test for the state's Constitution. "We do not have a clear standard of what constitutes an impeachable offense," he told The Post, which noted that no governor in the state's history had been removed from office through impeachment. More: Who is Ralph Northam, the Virginia governor who faces resignation calls after racist yearbook photo? "The language of the Virginia impeachment provision is slightly different from the relevant language in the U.S. Constitution but is similar in providing little in the way of clear guidance for defining an impeachable offense," Dinan said. While Northam said on Saturday that he would not resign, the political pressure to do so will likely persist, especially since some in his state said the explanations he offered on Saturday were not convincing. Larry Sabato, head of the Center for Politics at the University of Virginia, wrote on Twitter that if Northam does decide to step down he will be the first Virginia governor since the Civil War not to complete his term. Sabato also said that if his second-in-command, Lt. Gov. Justin Fairfax, finishes Northam's unexpired term, he will remain eligible to run for a full term in 2021. Under state law, governors are not allowed to run for re-election. This article originally appeared on USA TODAY: Virginia's governor won't resign over blackface, KKK photo. What's next?